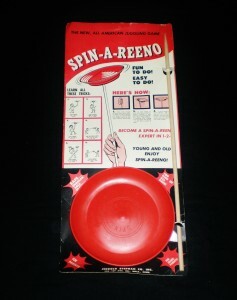 This is a Spin-A-Reeno plastic spinning plate from the 1950s. It was made by the Jerrold Stephan Co. Inc. of Minneapolis, MN. Complete with stick, cardboard backing, and plastic bag (not shown). 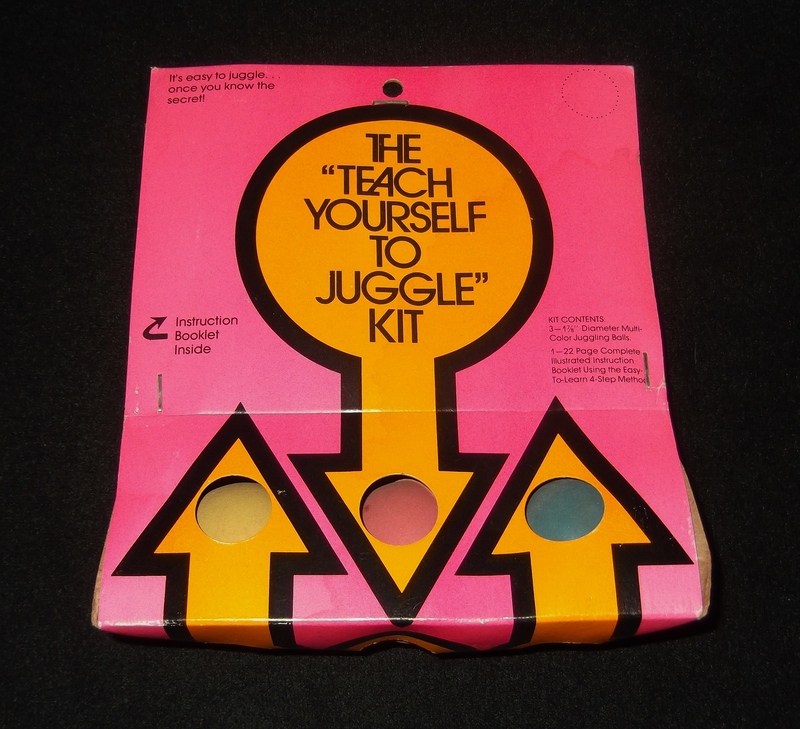 The Learn To Juggle With Jay Green Juggling Set came out in the mid 1970s. It was released by Pastime Industries Ltd. of New York, NY (USA). They approached Jay Green, an IJA champion and well known performer and juggling teacher from New York City, about putting together a juggling set. 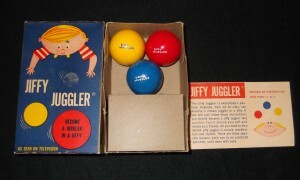 The set included three plastic covered foam balls similar to those in the Jiffy Juggling and Mastery of Juggling sets. It also included three cardboard “spinning discs” (which were like flat spinning plates with five divots in them), a pointed stick for the discs, and three colorful card board juggling rings. 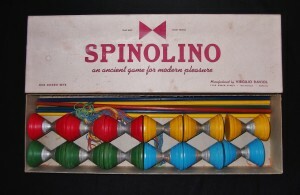 A later version of the set replaced the discs with scarves. The set also included a booklet titled Juggling Without Struggling written by Jay Green. The booklet taught a three ball cascade and reverse cascade, disc spinning, and three rings. These sets are very rare. Purchased by David Cain. 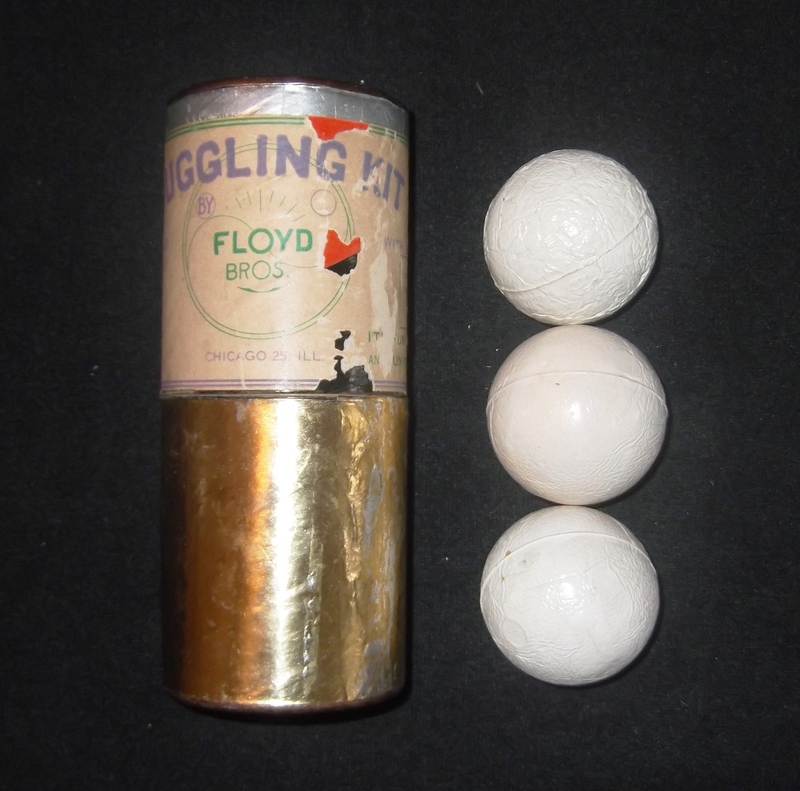 This is the only known existing Floyd Brothers Juggling Kit from the late 1940s. 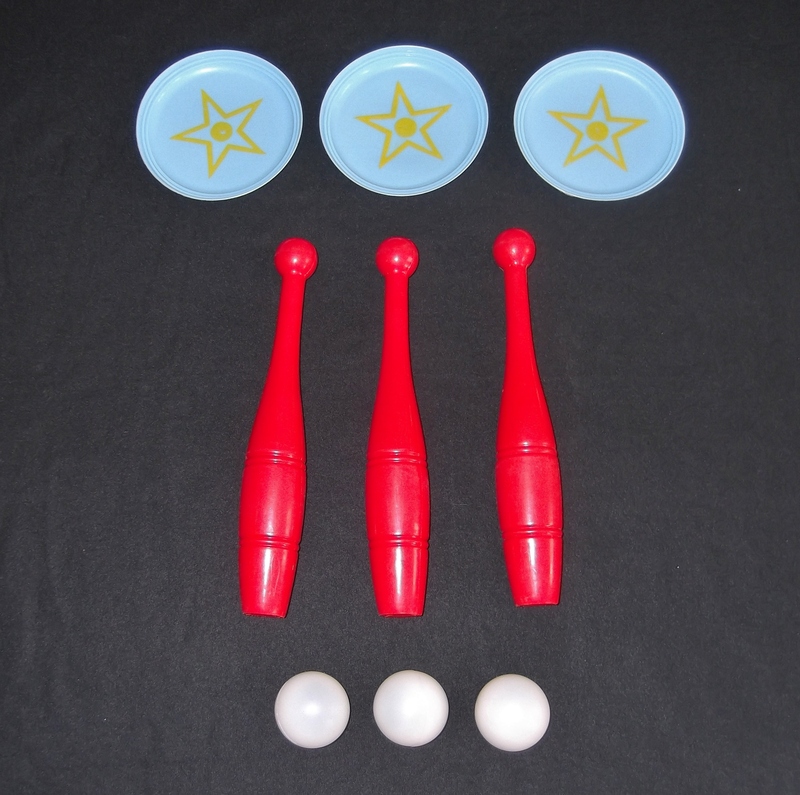 It may be the first ever retail juggling set. Purchased by David Cain. 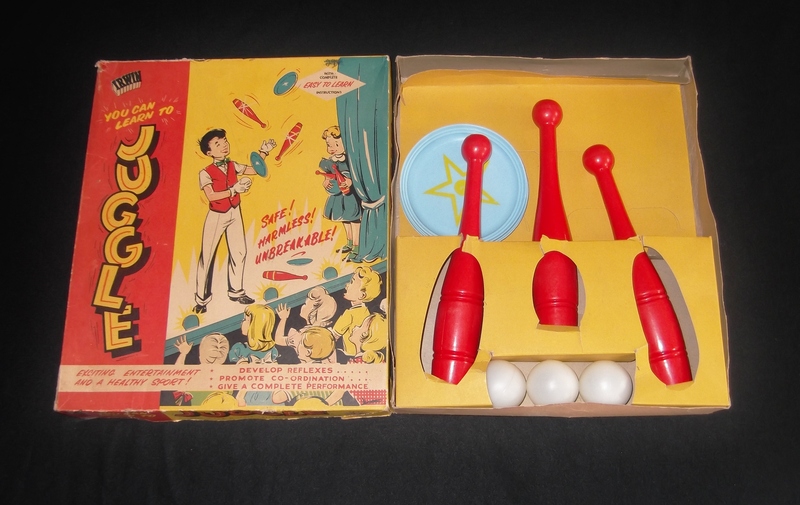 This is a “You Can Learn To Juggle” set from the 1950s. 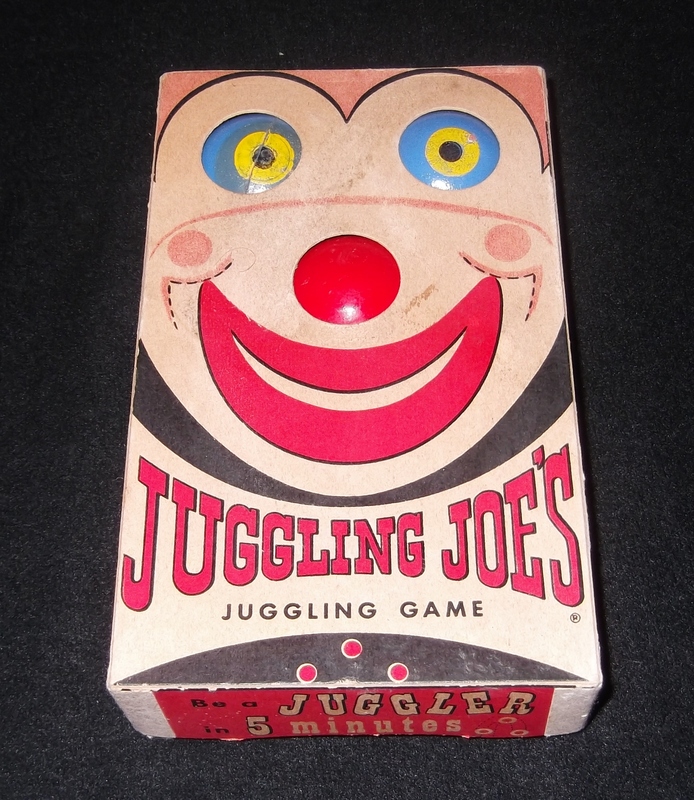 It was produced by the Irwin Corporation of New York City and contains the first plastic juggling clubs ever made. Purchased by David Cain. 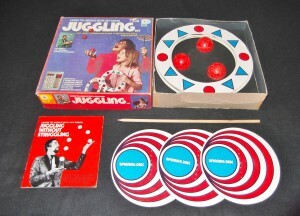 This is “Le Jongleur” juggling set from 1969. 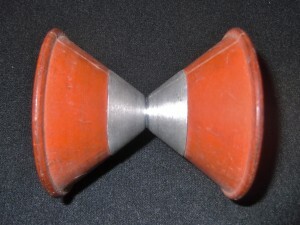 It was made by the Capiepa Corporation of France. 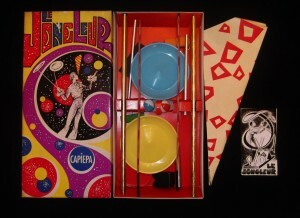 It contains two spinning plates and sticks and several gentleman juggler tricks, including two gimmicked tricks. Purchased by David Cain. This is “The Complete Illustrated Everything You Need To Juggle Kit”. It was made by the Delcon Corporation of Shrewsbury, Massachusetts (USA) and released in 1974. 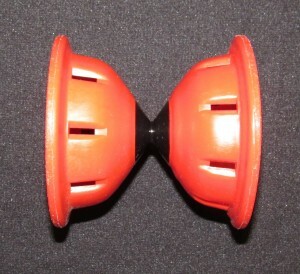 It includes three plastic coated foam balls and instructions. Purchased by David Cain. 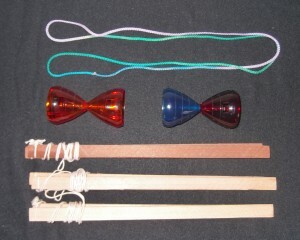 This is a Spinolino diabolo set made by Virgilio Raviol of San Francisco, CA. The year is unknown, but it is most likely from the 1950s or 1960s. It contains a dozen wooden diabolos. 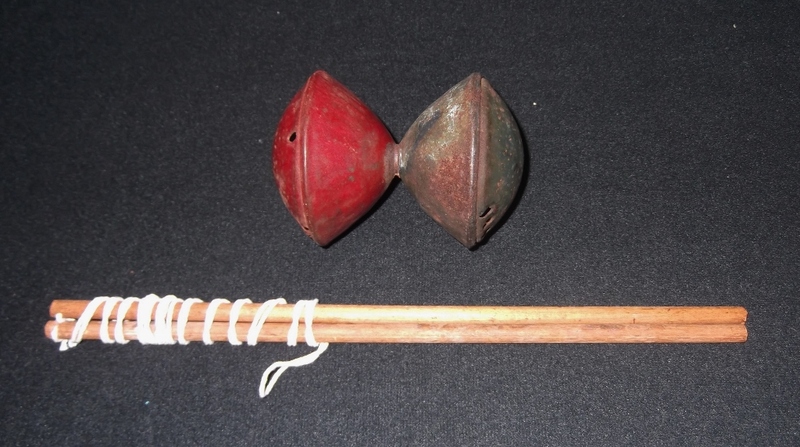 This is an old metal whistling diabolo advertising the Moseley Drug Store. It’s believed to be from the 1930s. Purchased by David Cain. 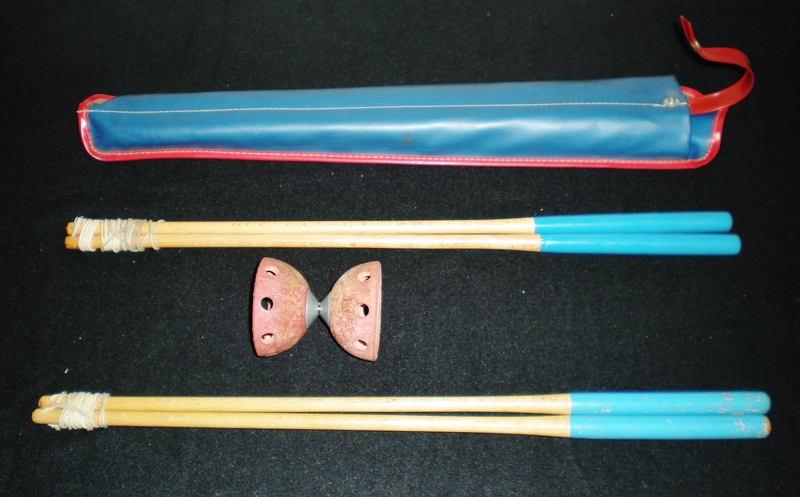 This is a vintage Super Top diabolo and hand sticks, most likely from the 1960s. 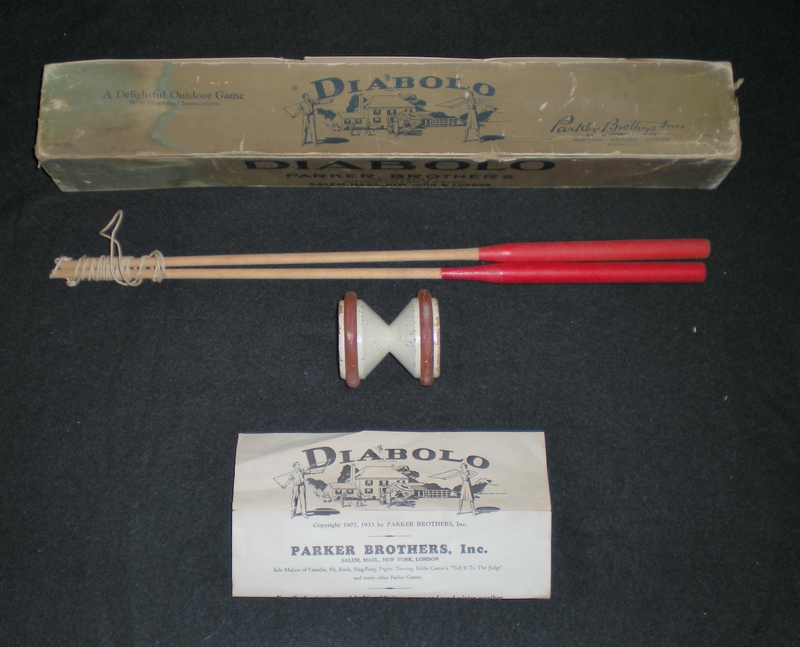 This is a vintage Twin Top diabolo and hand sticks made in Mansfield, Ohio in the 1950s. 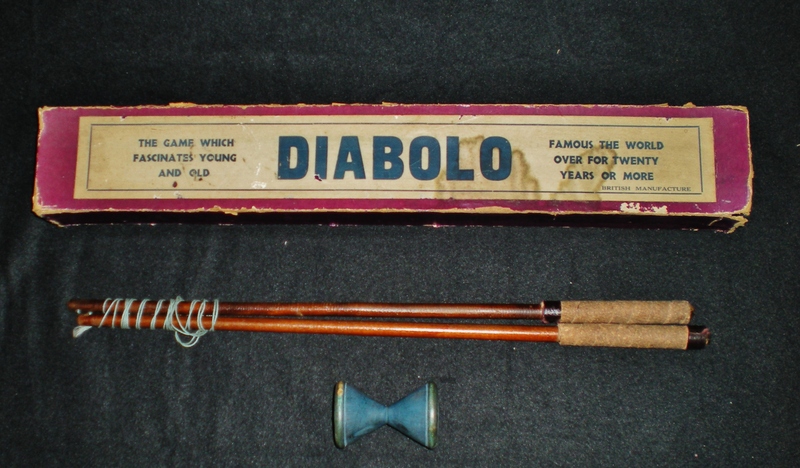 This is a vintage Chumbo Brevete diabolo. Year unknown. 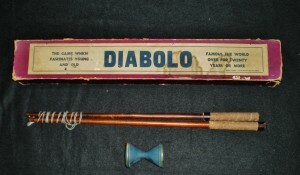 These are small diabolos sold by Jim Schreiber in the 1970s. 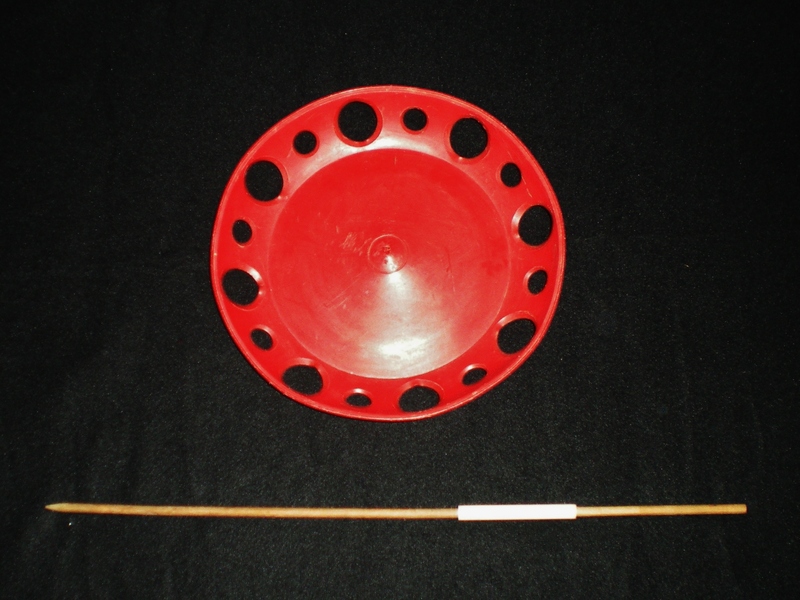 The top string is a loop and this may be the first example of stick-less diabolo. In the 1950s, the Brookglad Corporation of New York, NY (USA) released the Jiffy Juggler set. 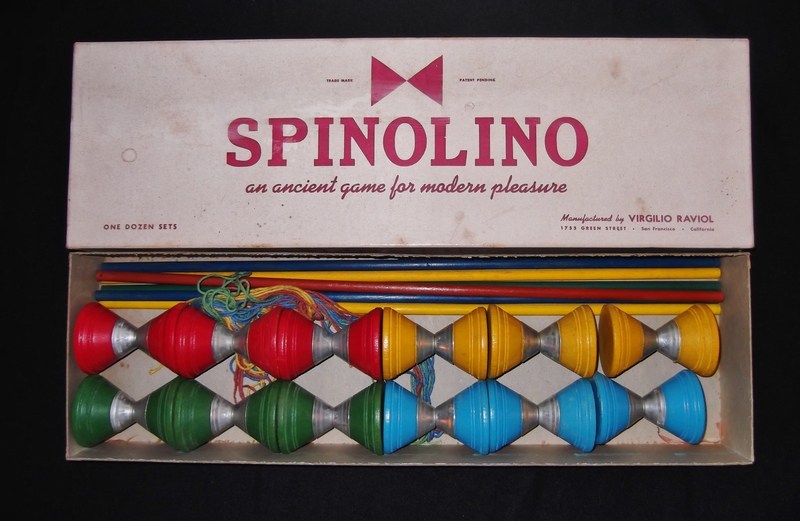 It was a very bare bones set, featuring three brightly colored, plastic coated dense foam balls and full color instructions on how to do a three ball cascade. There was no attempt to give any instruction beyond the most basic pattern. Purchased by David Cain. 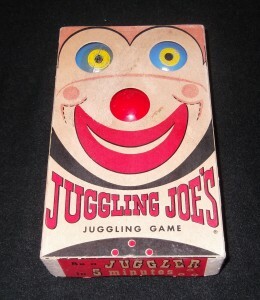 The “Juggling Joe’s Juggling Game” set was released in 1960 by the juggler Toscanelli (John Gaylord). As you can see in the picture, the clown had cut outs where the eyes and nose were and the balls protruded slightly through these holes. 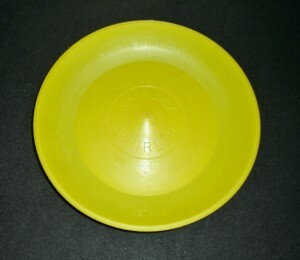 The lid could supposedly also be used as a clown mask. Even though it is called a “game”, it is simply a set of three balls and instructions. Purchased by David Cain. 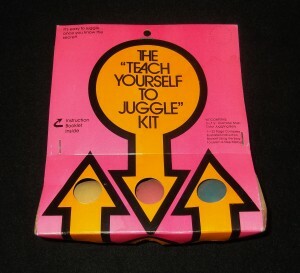 The “Teach Yourself To Juggle” Kit was released in the early 1970s. This is the only known example of it and has never been opened. Donated by Scott Cain. 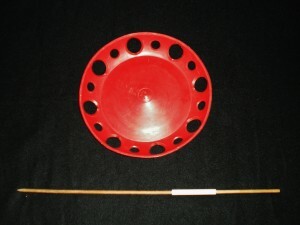 This is a 1950s plastic spinning plate of unknown manufacture complete with original spinning stick. 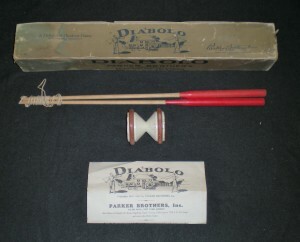 This is a Parker Brothers diabolo from 1933 complete with hand sticks, string, instructions, and box. 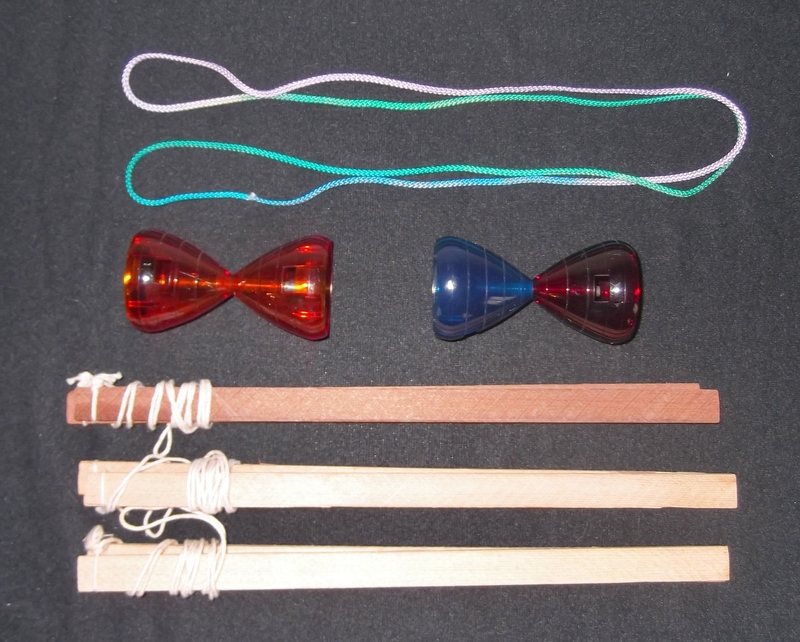 This is a British-made wooden diabolo from the 1930s complete with hand sticks, string, and box. 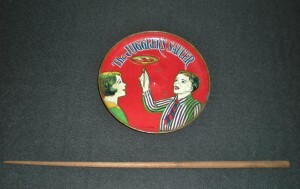 This is an extremely rare Juggler’s Saucer, a pre-WWII tin spinning plate manufactured in Japan. It’s from the late 1930s or early 1940s. 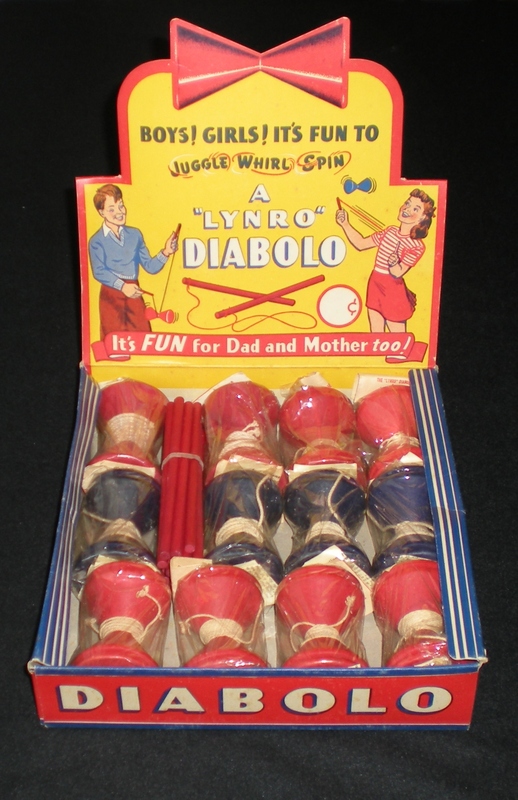 This is a very rare Whir Lo Tone tin diabolo from the early 1950s. 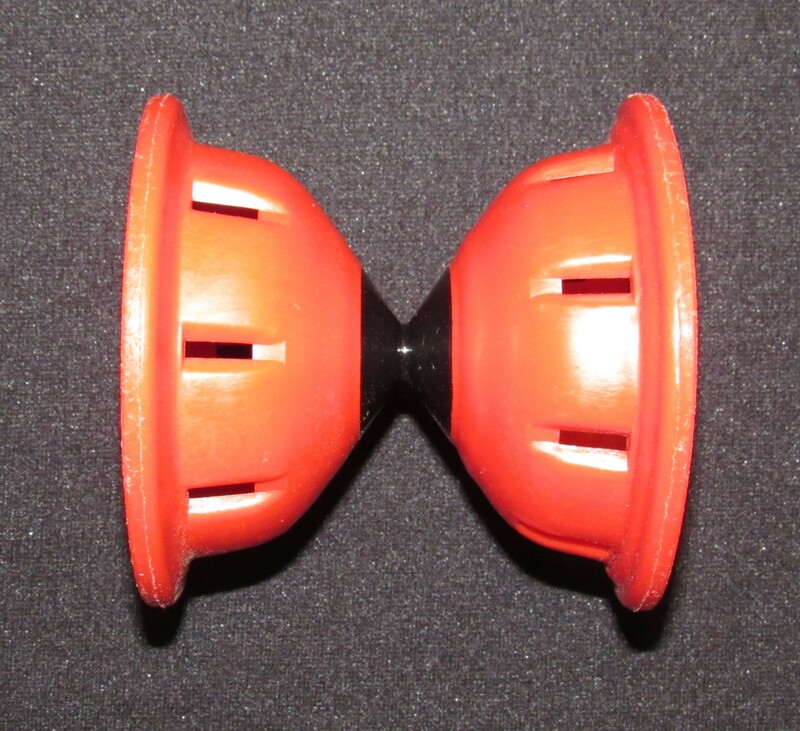 It whistles when spun quickly and is in extremely good condition. 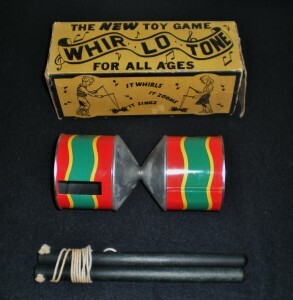 Manufactured by the Whir Lo Tone Corporation of Grand Rapids, MI (USA). Donated by Will Oltman. 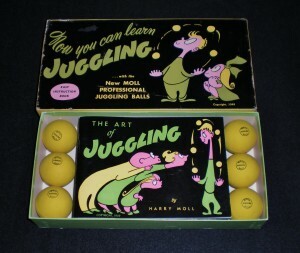 This is a Harry Moll Juggling Set from 1949. 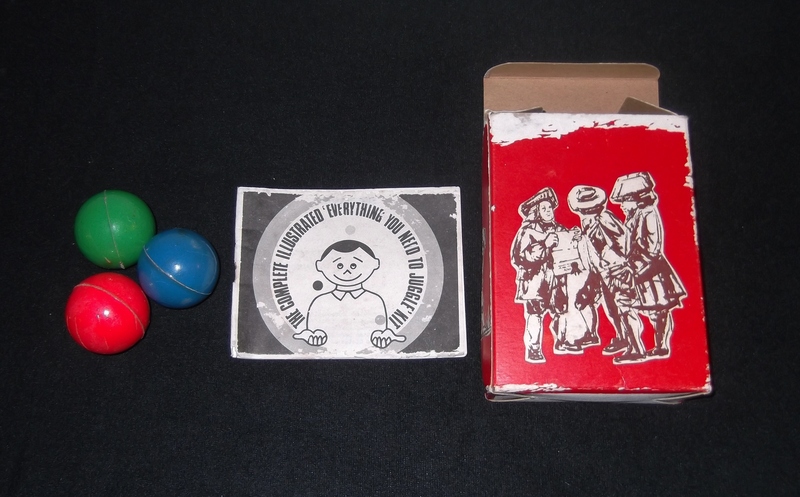 It includes six rubber balls and an instructional booklet. 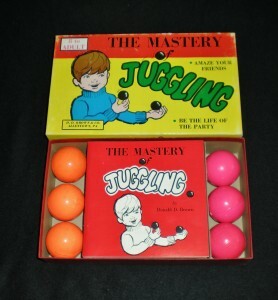 This was the first retail, mass marketed juggling set. This example is in almost perfect condition. 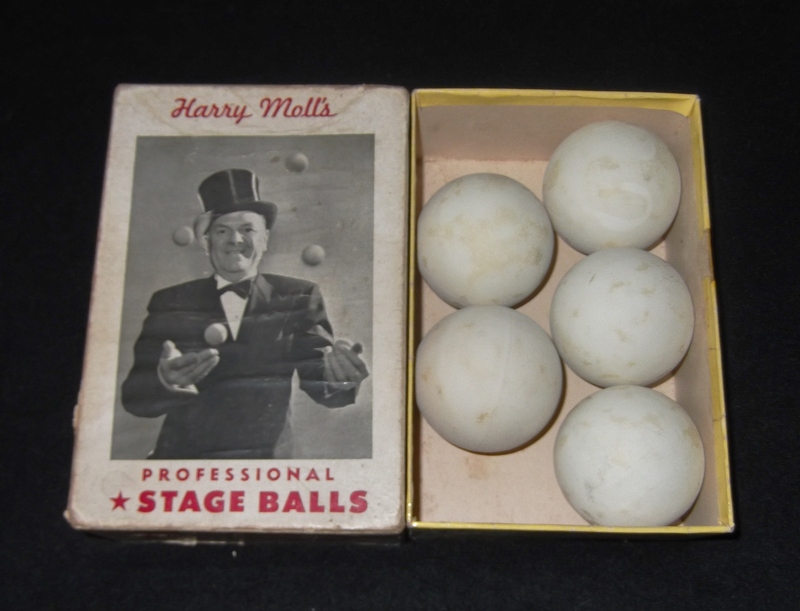 This is a Harry Moll Professional Stage Ball set. Donated by Ron Lubman. 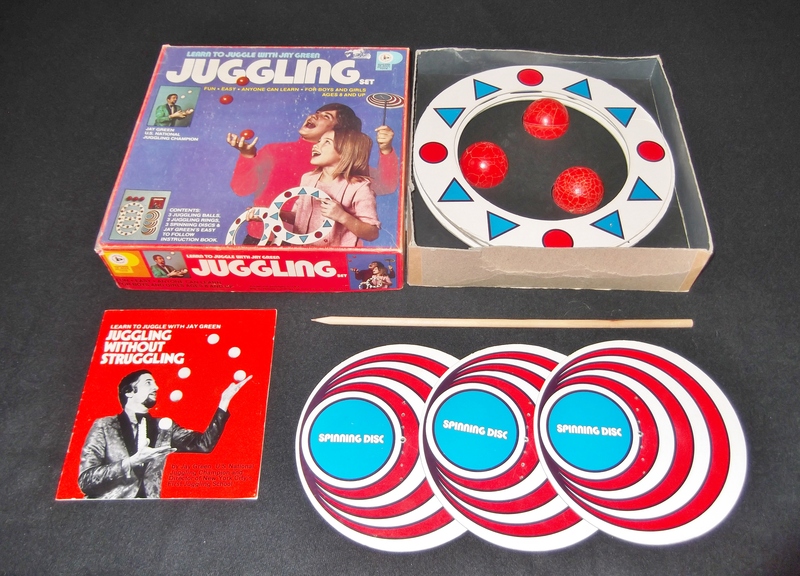 This is a Mastery of Juggling Set from 1974. It includes six coated foam balls and an instructional booklet. This example is in almost perfect condition. 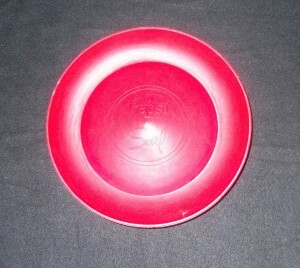 This is a Whirley Whirler plastic spinning plate from the 1950’s. It was the first plastic spinning plate available and sold for 98 cents. It was made by The Whirley Corporation of St. Louis, MO (USA). Two million of them were sold in 1958. 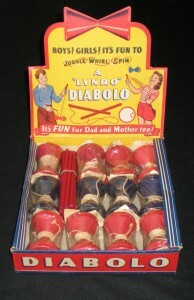 This is a Lynro Diabolo Display from the 1950’s containing 12 wooden diabolos still sealed in their packages with strings and instructions. Hand sticks are also included. 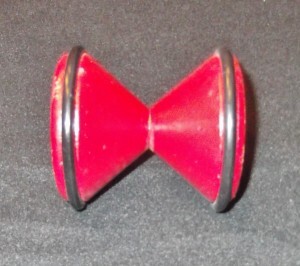 This is a 1950s Twin Top Diabolo manufactured in Mansfield, Ohio (USA). Purchased by David Cain. This is an F.A.O. 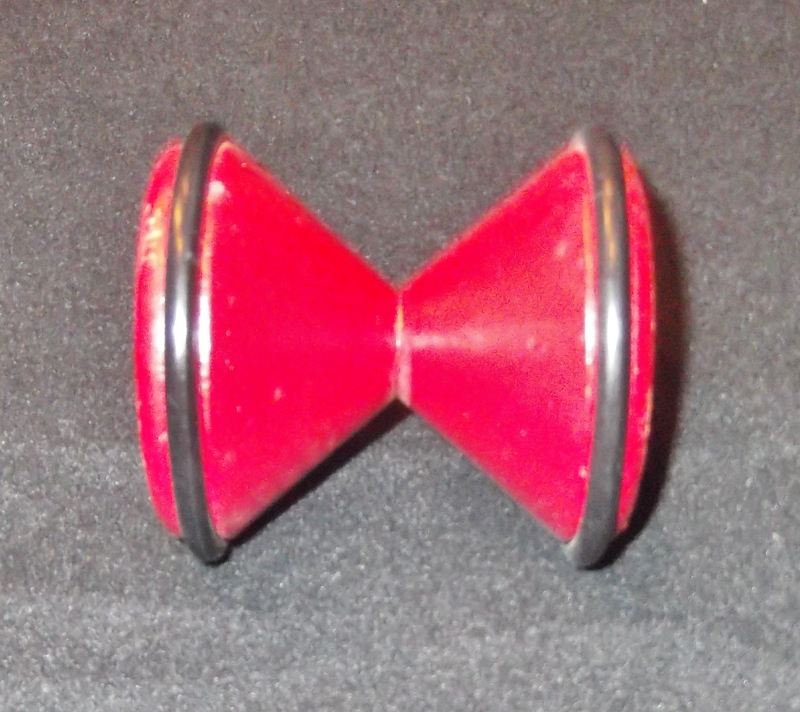 Schwarz diabolo set from the 1950’s. The set contains the diabolo, two pairs of hand sticks, and a carrying case with instructions. 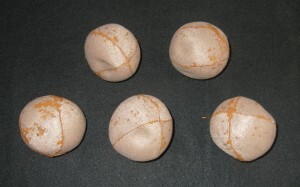 These are the first Gballz ever made by Gregory Poche. They were made in January of 2000. Donated by Gregory Poche. 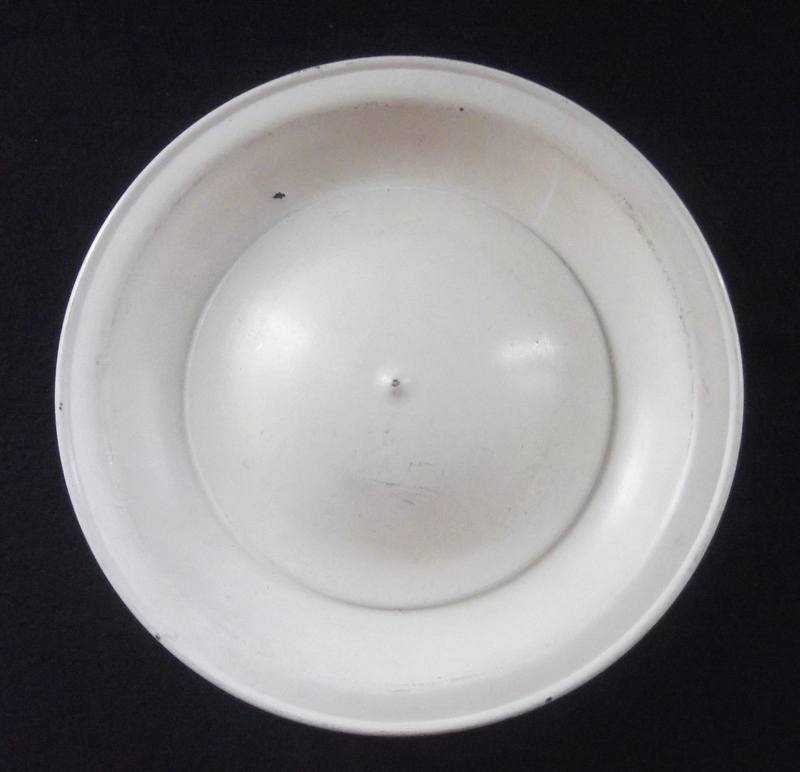 This is a metal spinning plate from the 1950s. Purchased by David Cain. 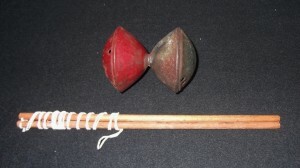 This is a very old whistling diabolo. Donated by Scott Cain. This is a plastic diabolo, most likely from the 1960s. Purchased by David Cain. 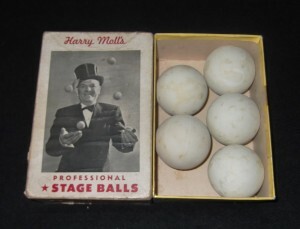 This is a Harry Moll Juggling Jr. Set from the early 1950s. Donated by Scott Cain.